Ten UTech, Jamaica Students and Faculty Awarded Scholarships to Canadian Universities — UTech, Ja. 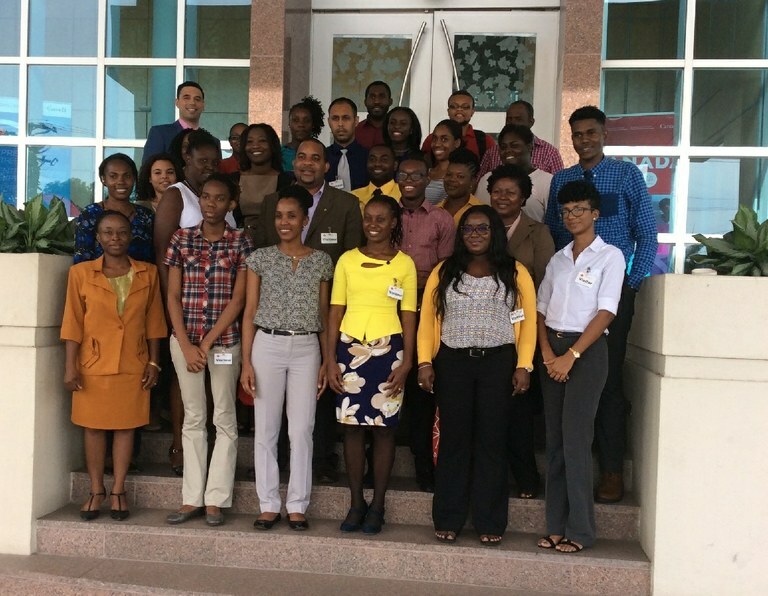 Damian Kotzev (3rd Row, first left) Second Secretary (Management) and Vice-Consul, High Commission of Canada in Jamaica poses for a group photograph with students and faculty from the University of Technology, Jamaica and the University of the West Indies, Mona who have been selected for study and developmental opportunities in Canada for the 2017/2018 Academic Year under the International Opportunities Programs of the Government of Canada – Emerging Leaders in the Americas Program (ELAP), Canada/CARICOM Leadership Program and the Canada/CARICOM Faculty Leadership Program (CCFLP). The occasion was an orientation and information session hosted by the High Commission at its Kingston offices on Thursday, July 6, 2017. Ten students and Faculty from the University of Technology, Jamaica (UTech, Ja.) have been selected for study and developmental opportunities in Canada for the 2017/2018 Academic Year under the International Opportunities Programs of the Government of Canada – Emerging Leaders in the Americas Program (ELAP), Canada/CARICOM Leadership Program and the Canada/CARICOM Faculty Leadership Program (CCFLP). All programs are funded by the Government of Canada. The ten awards are tenable at five Canadian post-secondary institutions: Brandon University, Ryerson University, Humber College Institute of Advanced Technology and Learning, University of Prince Edward Island and the University of Waterloo. Eight students were selected from the College of Business and Management. They are Romaine Fagan, Nicola Atkinson, Jenelle Taylor, Gedeisha Gordon and Davion Williams who will attend Brandon University for four months. Adera Williams will attend University of Prince Edward Island for four months and Tena-Kay Gilling and David Pringle will take up their scholarships at Humber College Institute of Technology and Advanced Learning for four months. Faculty member Dr. Andrea Pusey-Murray, Programme Director, College of Nursing will be International Liaison Officer at Ryerson University for two to three weeks. Dr. Aneisha Collins-Fairclough, Lecturer, and Head of Division for Research and Graduate Studies, Faculty of Science and Sport (FOSS) will be a member of Faculty at the University of Waterloo for five to six months. A special orientation and information session was hosted by the High Commission of Canada in Jamaica on Thursday, July 6 for students and faculty from the University of Technology, Jamaica and the University of the West Indies, Mona who have been selected for study and developmental opportunities in Canada for the 2017/2018 Academic Year.